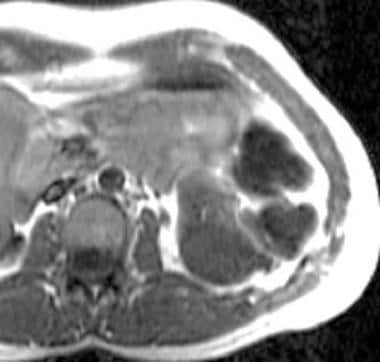 Contrast-enhanced computed tomography (CT) scan of the abdomen obtained during the nephrographic phase. 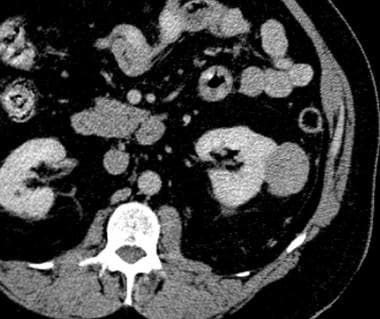 This CT scan shows a well-defined, enhancing mass lesion in the lower pole of the left kidney. A central hypoattenuating stellate scar is seen. T1-weighted magnetic resonance image (MRI). This MRI shows a homogeneous, hypointense, well-defined mass in the lower pole of the kidney. The degree of confidence is low for detecting oncocytomas with radiographs. Plain radiographic findings are nonspecific, and images may demonstrate a large, soft-tissue mass in the renal area with displacement of the fat planes. Calcification is rare. Excretory urography shows a large mass with a renal-contour abnormality and compression of the collecting system. False-positive results may arise with any lesion that causes a renal-contour abnormality. Examples include renal cysts, any renal mass, and focal infections. In addition, any retroperitoneal tumor may have a similar appearance. False-negative findings are due to the small size of the tumor and the presence of overlapping bowel. 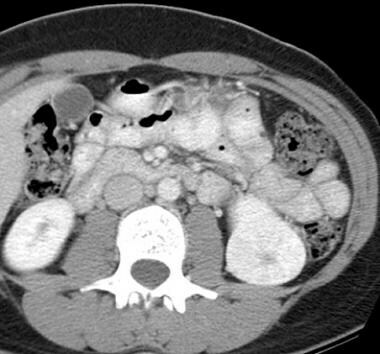 Contrast-enhanced computed tomography (CT) scan of the abdomen obtained during the nephrographic phase. This CT scan shows a well-defined, exophytic, solid mass from the midpole of the left kidney. The mass has an atypical appearance of an oncocytoma, is less attenuating than the renal parenchyma, and does not show a scar. Oncocytomas are well encapsulated and have distinct margins, a smooth contour, and a homogeneous appearance. The tumors may range in size from 3-10 cm, and in symptomatic patients, the lesions are most often larger than 5 cm. A central hypoattenuating scar may be observed in 33% of cases, but this scar cannot be differentiated from the central necrosis commonly found in renal cell carcinoma (RCC). With the advent of multisection CT scanning, high-resolution thin sections through the kidneys may improve detection of the central scar. Calcification, necrosis, and hemorrhage are rare with oncocytomas. Typically, features of a malignant tumor—such as invasion or infiltration into the perinephric fat, collecting system, or vessels—are absent. Likewise, regional lymphadenopathy and metastases are not encountered in patients with oncocytoma. Occasionally, multifocal or bilateral tumors may be found. On nonenhanced T1-weighted MRIs, oncocytomas are well-defined, homogeneous masses. They may appear isointense to hypointense relative to the renal cortex. On T2-weighted images, the tumors are typically isointense to slightly hypointense; however, slight T2 hyperintensity has also been reported. For MRIs of oncocytoma, see the images below. T2-weighted magnetic resonance image (MRI) of the kidney. This MRI shows that the lesion is hypointense and has a mildly hyperintense central scar (same patient as in the previous image). Contrast-enhanced T1-weighted magnetic resonance image (MRI). This MRI of the kidney shows homogeneous enhancement of the mass with a nonenhancing central scar. Note the lack of any tumoral invasion into the perinephric fat (same patient as in previous 2 images). When present, the tumor's scar may be seen as a hypointense, stellate area in the center of the lesion on T1- and T2-weighted MRIs. 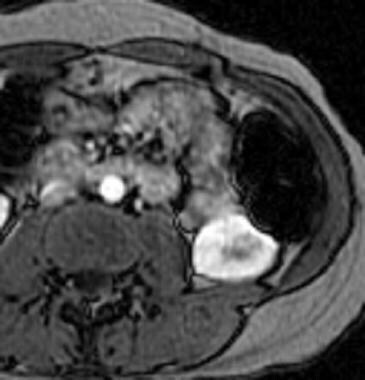 However, tumor necrosis, a common feature of malignant masses, appears hypointense on T1-weighted images and hyperintense on T2-weighted images. Rarely, the central scar may appear bright on T2-weighted images. After the intravenous administration of gadopentetate dimeglumine contrast material, oncocytomas show homogeneous enhancement, with a nonenhancing central scar. Gadolinium-based contrast agents have been linked to the development of nephrogenic systemic fibrosis (NSF) or nephrogenic fibrosing dermopathy (NFD). The disease has occurred in patients with moderate to end-stage renal disease after being given a gadolinium-based contrast agent to enhance MRI or MRA scans. NSF/NFD is a debilitating and sometimes fatal disease. Characteristics include red or dark patches on the skin; burning, itching, swelling, hardening, and tightening of the skin; yellow spots on the whites of the eyes; joint stiffness with trouble moving or straightening the arms, hands, legs, or feet; pain deep in the hip bones or ribs; and muscle weakness. The degree of confidence with MRIs for detecting this lesion is high, but this technique's degree of confidence is low for making a specific diagnosis. Differentiating an oncocytoma from an RCC and other solid renal tumors is not always possible. Scintigraphy is not routinely performed in the evaluation of renal tumors. On technetium-99m (99m Tc) dimercaptosuccinic acid (DMSA) scans, the oncocytoma appears as a photopenic area that displaces the renal cortex and collecting system. On fluorodeoxyglucose (FDG) positron emission tomography (PET) scans, oncocytomas usually have less FDG uptake than RCCs. The amount of uptake is usually isointense relative to the renal parenchyma. However, oncocytomas can occasionally have uptake in the range similar to that of RCC uptake. The degree of confidence with nuclear medicine is low. False-positive results are due to renal cysts or other photopenic renal masses. False-negative results occur if the mass is small or if the lesion does not cause a renal-contour abnormality. With the advent of CT scanning, routine angiography is not performed to diagnose renal masses. However, the classic angiographic findings for oncocytomas include a spoke-wheel arrangement of tumoral vessels, homogeneous tumoral contrast during the capillary phase, sharp demarcation from the kidney and surrounding areas, and a peritumoral halo (lucent-rim sign). Bizarre neoplastic vessels are conspicuously absent, which is in contrast to RCC. The degree of confidence with angiography is low. Hypovascular lesions may result in false-negative results, and hypervascular lesions may mimic RCCs. Schatz SM, Lieber MM. Update on oncocytoma. Curr Urol Rep. 2003 Feb. 4(1):30-5. [Medline]. Young JR, Coy H, Kim HJ, Douek M, Lo P, Pantuck AJ, et al. Performance of Relative Enhancement on Multiphasic MRI for the Differentiation of Clear Cell Renal Cell Carcinoma (RCC) From Papillary and Chromophobe RCC Subtypes and Oncocytoma. AJR Am J Roentgenol. 2017 Apr. 208 (4):812-819. [Medline]. Bhatt NR, Davis NF, Flynn R, McDermott T, Thornhill JA, Manecksha RP. Dilemmas in diagnosis and natural history of renal oncocytoma and implications for management. Can Urol Assoc J. 2015 Sep-Oct. 9 (9-10):E709-12. [Medline]. Biswas B, Wahal SP, Gulati A. Renal oncocytoma: A diagnostic dilemma on cytology. J Cytol. 2014 Jan. 31 (1):59-60. [Medline]. Trpkov K, Yilmaz A, Uzer D, Dishongh KM, Quick CM, Bismar TA. Renal oncocytoma revisited: a clinicopathological study of 109 cases with emphasis on problematic diagnostic features. Histopathology. 2010 Dec. 57(6):893-906. [Medline]. Giunchi F, Fiorentino M, Vagnoni V, Capizzi E, Bertolo R, Porpiglia F, et al. Renal oncocytosis: a clinicopathological and cytogenetic study of 42 tumours occurring in 11 patients. Pathology. 2016 Jan. 48 (1):41-6. [Medline]. Millet I, Doyon FC, Hoa D, Thuret R, Merigeaud S, Serre I. Characterization of small solid renal lesions: can benign and malignant tumors be differentiated with CT?. AJR Am J Roentgenol. 2011 Oct. 197(4):887-96. [Medline]. Schieda N, Al-Subhi M, Flood TA, El-Khodary M, McInnes MD. 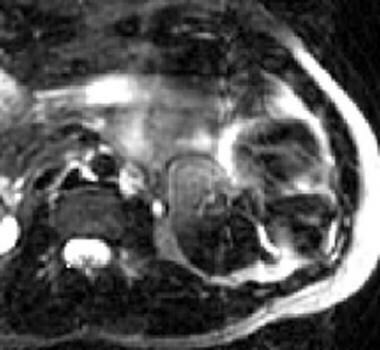 Diagnostic accuracy of segmental enhancement inversion for the diagnosis of renal oncocytoma using biphasic computed tomography (CT) and multiphase contrast-enhanced magnetic resonance imaging (MRI). Eur Radiol. 2014 Nov. 24 (11):2787-94. [Medline]. Rowe SP, Gorin MA, Gordetsky J, Ball MW, Pierorazio PM, Higuchi T, et al. Initial experience using 99mTc-MIBI SPECT/CT for the differentiation of oncocytoma from renal cell carcinoma. Clin Nucl Med. 2015 Apr. 40 (4):309-13. [Medline]. Coy H, Young JR, Douek ML, Brown MS, Sayre J, Raman SS. Quantitative computer-aided diagnostic algorithm for automated detection of peak lesion attenuation in differentiating clear cell from papillary and chromophobe renal cell carcinoma, oncocytoma, and fat-poor angiomyolipoma on multiphasic multidetector computed tomography. Abdom Radiol (NY). 2017 Mar 9. [Medline]. Sasaguri K, Takahashi N, Gomez-Cardona D, Leng S, Schmit GD, Carter RE, et al. Small (< 4 cm) Renal Mass: Differentiation of Oncocytoma From Renal Cell Carcinoma on Biphasic Contrast-Enhanced CT. AJR Am J Roentgenol. 2015 Nov. 205 (5):999-1007. [Medline]. Paño B, Macías N, Salvador R, Torres F, Buñesch L, Sebastià C, et al. Usefulness of MDCT to Differentiate Between Renal Cell Carcinoma and Oncocytoma: Development of a Predictive Model. AJR Am J Roentgenol. 2016 Apr. 206 (4):764-74. [Medline]. Wu J, Zhu Q, Zhu W, Chen W, Wang S. Comparative study of CT appearances in renal oncocytoma and chromophobe renal cell carcinoma. Acta Radiol. 2016 Apr. 57 (4):500-6. [Medline]. Zokalj I, Marotti M, Kolarić B. Pretreatment differentiation of renal cell carcinoma subtypes by CT: the influence of different tumor enhancement measurement approaches. Int Urol Nephrol. 2014 Jun. 46 (6):1089-100. [Medline]. Kuroda N, Tanaka A, Ohe C, Mikami S, Nagashima Y, Sasaki T, et al. Review of renal oncocytosis (multiple oncocytic lesions) with focus on clinical and pathobiological aspects. Histol Histopathol. 2012 Nov. 27 (11):1407-12. [Medline]. Mistry R, Manikandan R, Williams P, et al. Implications of computer tomography measurement in the management of renal tumours. BMC Urol. 2008 Nov 4. 8:13. [Medline]. [Full Text]. Wu J, Zhu Q, Zhu W, Chen W, Wang S. Comparative study of CT appearances in renal oncocytoma and chromophobe renal cell carcinoma. Acta Radiol. 2015 May 13. [Medline]. Prasad SR, Surabhi VR, Menias CO, Raut AA, Chintapalli KN. Benign renal neoplasms in adults: cross-sectional imaging findings. AJR Am J Roentgenol. 2008 Jan. 190(1):158-64. [Medline]. Woo S, Cho JY, Kim SH, Kim SY, Lee HJ, Hwang SI. Segmental enhancement inversion of small renal oncocytoma: differences in prevalence according to tumor size. AJR Am J Roentgenol. 2013 May. 200(5):1054-9. [Medline]. Pedrosa I, Sun MR, Spencer M, et al. MR imaging of renal masses: correlation with findings at surgery and pathologic analysis. Radiographics. 2008 Jul-Aug. 28(4):985-1003. [Medline]. Fan L, Lianfang D, Jinfang X, Yijin S, Ying W. Diagnostic efficacy of contrast-enhanced ultrasonography in solid renal parenchymal lesions with maximum diameters of 5 cm. J Ultrasound Med. 2008 Jun. 27(6):875-85. [Medline]. Lou L, Teng J, Lin X, Zhang H. Ultrasonographic features of renal oncocytoma with histopathologic correlation. J Clin Ultrasound. 2014 Mar-Apr. 42 (3):129-33. [Medline]. Zippel L. Zur kenntnis der onkocyten. Virchows Arch Pathol Anat Histopathol. 1942. 308:360-82. Klein MJ, Valensi QJ. Proximal tubular adenomas of kidney with so-called oncocytic features. A clinicopathologic study of 13 cases of a rarely reported neoplasm. Cancer. 1976 Aug. 38(2):906-14. [Medline]. Cyberattacks in Medicine: Is Radiology the Weakest Link?